Management of pelvic fracture associated haemorrhage is often complex with high morbidity and mortality rates. Different treatment options are used to control bleeding with an on-going discussion in the trauma community regarding the best management algorithm. Recent studies have shown trans-arterial embolisation (TAE) to be a safe and effective technique to control pelvic fracture associated haemorrhage. Computed tomography (CT) evidence of active bleeding, haemodynamic instability, and pelvic fracture patterns are amongst important indicators for TAE. Herein, we aim to provide a comprehensive literature review of the effectiveness of TAE in controlling haemorrhage secondary to pelvic fracture according to the indications, technique and embolic agents, and outcomes, whilst incorporating our Level 1 major trauma centre’s (MTC) results between 2014-2017. Trauma is a leading cause of death in the young population (Sauaia et al., 1995). Pelvic fractures are present in up to 9.3% of patients with high energy blunt trauma, especially following road traffic accidents (Demetriades et al., 2002; El-Haj et al., 2013; Katsura et al., 2013; Hauschild et al., 2012). Pelvic fractures are often associated with other visceral and vascular injuries (Ertel et al., 2001). Bleeding is a common occurrence in patients with pelvic ring fracture and it is the second most common cause of death after brain injury in these patients (Sauaia et al., 1995; Kauvar et al., 2006). Although the mortality rate in patients with pelvic fractures can be as high as 13.5%, it significantly rises to 40–60% in patients with pelvic fracture and haemodynamic instability secondary to haemorrhage (Demetriades et al., 2002; Starr et al., 2002). It is imperative during the initial management of polytrauma cases to lower the mortality rate secondary to bleeding. One of the main causes of early mortality is massive haemorrhage and shock, while later mortality is predominantly due to adult respiratory distress syndrome and multi organ failure, the latter as a result of massive blood transfusion with the subsequent inflammatory response (Sauaia et al., 1995; Fangio et al., 2005; Smith et al., 2007; Wong et al., 2000). Therefore timing is crucial in the management of these patients as early identification and control of pelvic haemorrhage might result in the reduction of pelvic fracture-related mortality and improve outcome (Agolini et al., 1997). Previously published studies compared different methods of intervention including open laparotomy, pelvic packing, pelvic binders and trans-arterial embolisation (TAE), however such comparison proved difficult for several reasons (Burlew et al., 2011). This mainly is due to the variation in the availability of embolisation services between different hospitals, management algorithms between different hospitals and inconsistent criteria for patients’ referral for embolisation. Whilst there is growing evidence that suggests TAE for the treatment of acute haemorrhage in trauma patients is a safe and cost-effective method, current national guidelines identified the lack of high-level evidence with regards to the effectiveness of TAE. This is likely due to the non-existence of prospective and/or randomized studies or trials given the challenging ethical issues associated with this type of emergency research (NICE, 2016). Therefore, we set out to provide a comprehensive literature review of the effectiveness of TAE in controlling haemorrhage secondary to pelvic fracture, whilst incorporating our Level 1 major trauma centre’s (MTC) results with mid-term outcome analysis. TAE has been more frequently used to control pelvic fracture related bleeding since it was described in the literature in the 1970s with a high success rate of 80–100% (Fangio et al., 2005; Agolini et al., 1997; White et al., 2009; Velmahos et al., 2000a), especially where mechanical compression by pelvic packing and pelvic binders are ineffective (Fangio et al., 2005; Agolini et al., 1997; White et al., 2009; Velmahos et al., 2000a; Velmahos et al., 2002). It is shown to be effective against arterial haemorrhage, which is the source of bleeding in about 15% of pelvic fracture associated haemorrhage (Eastridge et al., 2002). TAE is also equally effective in cases of pelvic re-bleeding following initial angiography +/− embolisation in the emergency setting (Cullinane et al., 2011). It has been reported that any contrast extravasation on a computed tomography (CT) scan is highly predictive of active bleeding with sensitivity and specificity values ranging between 66 and 90% and 85–98% respectively (Ierardi et al., 2015; Miller et al., 2003). Furthermore, the exact haemorrhagic site can often be identified on CT and correlates closely with the angiographic findings, which guides the time critical TAE treatment by the interventional radiologist. Previous studies have indicated the need for TAE based on any contrast extravasation seen on CT, however in another study nearly half of the patients with contrast extravasation on CT did not require embolisation (Stephen et al., 1999; Michailidou et al., 2012). In our study, only 11 patients had active contrast extravasation on CT, shown as a high density focus due to a leaking blush/jet of contrast (Figs. 1 and 2). However, a bleeding point was demonstrated in 19 patients on angiography (Table 2). The discrepancy between CT and angiographic findings in demonstrating active bleeding has been postulated to be due to vessel spasm, which is thought to be secondary to local inflammatory response generated by bleeding or hypotension (Dietrich & Dacey, 2000). Hence, it is imperative to consider proceeding to angiography +/− TAE following a trauma CT scan if the clinical suspicion remains high of underlying bleeding based on the type of pelvic fracture and haemodynamic stability. There have been attempts to stratify groups of patients who would benefit from TAE in terms of their haemodynamic status, transfusion requirement, pelvic fracture pattern and other associated injuries (El-Haj et al., 2013; Abrassart et al., 2013; Fu et al., 2013; Barentsz et al., 2011; Metsemakers et al., 2013). Previous studies have identified pelvic fracture instability and various fracture patterns (Young-Burgess classification system) such as types 2 and 3 anterior-posterior, type 3 lateral and vertical compression pelvic injuries or combined mechanisms are strongly associated with arterial haemorrhage, and should be considered when deciding the primary method of haemorrhage control (Ierardi et al., 2015; Manson et al., 2010). On the contrary, few authors did not find any significant correlation between pelvic fracture severity or grading and the need for TAE or haemodynamic instability (Comai et al., 2016). These differences remain controversial and can be accounted for by the difference in management algorithms and sample sizes. In the trauma setting, pelvic injuries often co-exist with other visceral injuries, which may impact the initial management and final outcome. The injury severity score (ISS) is an established scoring system used to quantify the severity of injuries for a patient. Each injury is given a score of between 1 (minor injury) and 6 (incompatible with life) and the total ranges from 1 to 75 (TARN, n.d.). Few studies have demonstrated an association between high ISS scores (> 25) and a favourable outcome following TAE (Karadimas et al., 2011). Some authors have argued that in certain cases where active bleeding is identified secondary to unstable pelvic fractures and concomitant intra-abdominal injuries, the treatment option would be simplified by surgical intervention (Demetriades et al., 2002). However, other studies suggest that exploratory laparotomy has limited success in identifying bleeding sites and ligating small affected arterial branches (Niola et al., 2012). TAE has also been shown to be equally effective with a lower mortality rate, to deal with concomitant pelvic and intra-abdominal bleeding (Fang et al., 2011). Hence, given its less invasive nature, many view TAE as the favoured treatment option. Increased initial transfusion requirements of > 0.5unit/hour and haemodynamic instability, defined as a systolic blood pressure (SBP) below 90 mmHg, tachycardia and capillary refill time > 2 s have been shown to be further predictors for TAE (Karadimas et al., 2011). The recent Western Trauma Association update has outlined TAE as the primary method of haemorrhagic control in patients resistant to fluid resuscitation and mechanical stabilisation (Tran et al., 2016). However, due to inconsistencies in the availability and delays in performing TAE between institutions, the decision to take the patient to theatre for pre-peritoneal packing or angiography suite for TAE would be made following discussion between the trauma team members taking into consideration the CT findings and the haemodynamic status of the patient (Lustenberger et al., 2015). Interestingly, age (above 60) has also been documented as an independent predictor for TAE, regardless of the haemodynamic status (Kimbrell et al., 2004). In our study, there was no significant correlation between the haemodynamic stability, ISS and the embolisation or mortality outcome as compared to some studies (Katsura et al., 2013; Abrassart et al., 2013; Matityahu et al., 2013; Tanizaki et al., 2014) . In select cases, re-bleeding may occur following initial therapy, with a reported rate of up to 9.7% (Ierardi et al., 2016; Gourlay et al., 2005; Shapiro et al., 2005). Authors have identified specific risk factors to allow early identification of a re-bleed, which include pre-procedural haemoglobin of < 7.5 mg/dl, initial finding of greater than two bleeding sites, absence of concomitant intra-abdominal visceral injury, post-procedural transfusion requirement of > 6 units RBC and continued haemodynamic instability, super-selective embolisation and a persistent base deficit (Gourlay et al., 2005; Shapiro et al., 2005; Fang et al., 2009). In these cases, operators may opt for selective or non-selective embolisation according to preference. There are multiple proposed management algorithms for pelvic trauma patients, which may vary between institutions. Our institution follows the trauma algorithm as demonstrated (Fig. 3) (Chakraverty et al., 2012). The trauma algorithm at our institution is also derived from NICE guidelines on pelvic imaging in setting of poly-trauma (suspected pelvic or acetabular fracture) transferred to an MTC. 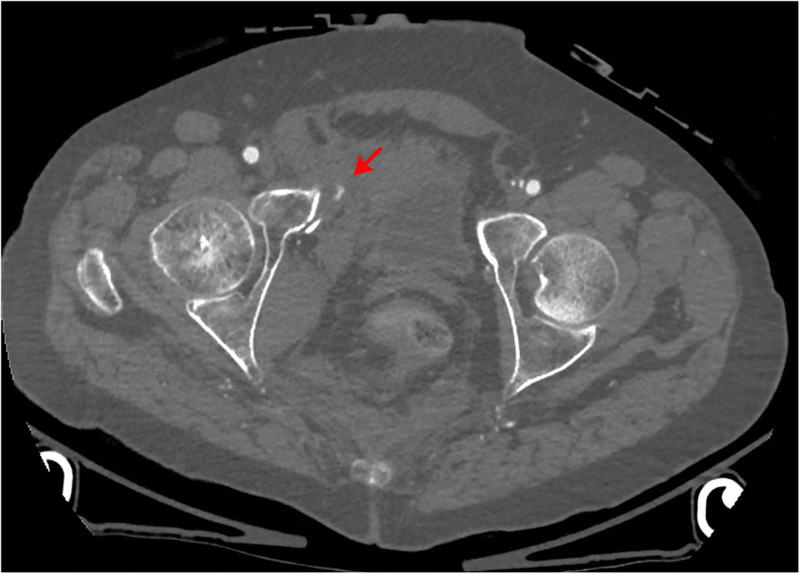 Our local approach recommends that the trauma patient undergoes a dual phase CE-CT scan as a first-line imaging in adults with suspected high-energy pelvic fractures. Our conventional trauma imaging protocol is performed withan intravenous injection of 90mls contrast medium, given at a rate of 3.5 ml/sec. Two spiral acquisitions CT chest/abdomen/pelvis are obtained, the first at 20s to obtain an arterial phase and followed by a porto-venous (PV) phase at 70s. Alternatively, some institutions have adopted the Camp Bastion protocol, which was initially practiced by the Armed Forces for trauma injuries at Camp Bastion, Afghanistan (Graham, 2012). This protocol constitutes a bi-phasic contrast enhanced whole body CT, where a single split-rate injection is administered at two different rates (1/3 at 1.5 ml/sec, 2/3 at 3.5mls) before scanning at 70s (Hakim et al., 2016). This has the advantage of reducing radiation and scan time. Recent studies have demonstrated comparable imaging quality using bi-phasic protocol with single CT acquisition (Hakim et al., 2016; Beenen et al., 2015). At our trauma centre, an active bleeding site is identified as a high density focus due to a leaking blush/jet of contrast seen on the arterial phase scan, with further pooling of contrast on the PV phase. Other forms of arterial injury such as pseudo-aneurysm formation, arterio-venous fistula, dissection or transection have also been documented (Ptohis et al., 2017; Frandon et al., 2016). Secondary signs of bleeding include retroperitoneal hematoma, which may be present without signs of contrast extravasation. Regarding the angiography procedure itself, most authors described a standard approach via the common femoral artery (CFA). Under local anaesthesia in the groin, the CFA is punctured with a needle and a 4 or 5French sheath is then introduced using the Seldinger technique to secure access into the arterial tree. Our local practice is to start with an aortogram to delineate the anatomy first, then guided by CT positive findings a direct catheterisation of the suspected internal iliac artery would follow. Contrast is then injected to identify the bleeding point, identified as a focus of contrast extravasation/blush. Digital subtraction angiography (DSA) is used to guide the operator along the arterial map (49). Standard catheter use is by default recommended at our institution. However, if the bleeding point is not evident, further selective micro-catheterisation and angiogram of the pelvic arterial branches on the affected side is necessary to identify the bleeding point. Once this is evident, the bleeding artery is embolised accordingly using a variety of embolic material (e.g. micro-coils and/or glue), which is further discussed below. Interrogating the internal iliac artery (IIA) branches is crucial as they are a common source of bleeding (Fangio et al., 2005; Smith et al., 2007). Bleeding from branches of the external iliac and common femoral arteries has also been described in previous studies (Barentsz et al., 2011; Metsemakers et al., 2013). Therefore, exploring these arteries is essential to avoid missing a bleeding source. 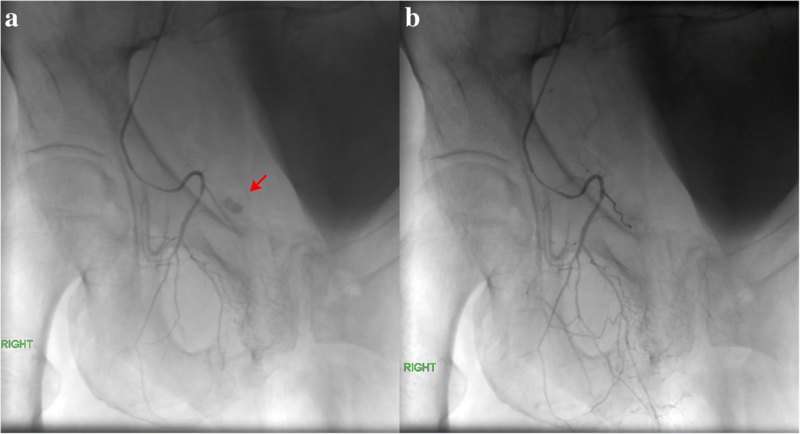 Occasionally, when there are multiple distal bleeding sites identified, the operator may opt to perform proximal or non-selective embolisation using temporary embolic materials to save valuable time in haemodynamically unstable patients. In our study, TAE was the primary management line to control bleeding in 22 patients while 2 patients initially underwent laparotomy followed by TAE. Apart from one patient with a single actively bleeding branch of the external iliac artery, various branches of the internal iliac artery were the main culprits in the remaining cohort of patients. In every TAE, the operator confirmed a well-sealed arterial defect and stoppage of contrast leakage on a final DSA run. Selective embolisation performed in 17 of 24 cases (Fig. 4) was associated with improved survival outcome (Fig. 5). Various embolic agents are available at the operator’s disposal. Gelfoam and coils seem to be the most commonly used materials, either as a single agent or a combination of the two, as was the case in this study (Table 3, Figs. 4, 6, 7). Gelfoam is a biodegradable gelatine sponge, which can be cut to size, and is mixed with contrast and normal saline prior to delivery. Gelfoam remains the most popular choice as it is a temporary embolic agent, which lasts for 7–21 days, and is relatively easy and economical to use (Frevert et al., 2008; Suzuki et al., 2005). A previous study also showed no long or short-term complications associated with the use of Gelfoam (Travis et al., 2008). Coils and vascular Amplatzer plugs (self-expandable nitinol occlusion device) are frequently used for more definitive and targeted embolisation of distal vessels. Metallic coils come in various sizes and are generally coated with thrombogenic material (fibrogenic fibers) or are uncovered. They allow rapid mechanical occlusion of the vessel as they are injected through the microcatheter. Several coils are usually required to conform into an occlusive coil ball, which creates a scaffold for thrombosis (Frandon et al., 2016). However, extensive coil usage precludes distal vessel access in cases of re-bleeding. Liquid agents such as Glue (n-butylcyanoacrylate) or Onyx may be considered for very distal vessels and can be used in cases of re-bleeding. However, due to increased costs, difficulties in controlling the amount used, slow administration and reflux of the agent upstream, the role of liquid agents in a time critical procedure is limited (Frandon et al., 2016). Between January 2014 to June 2017, A total of 24 adult patients [17 male, 7 female, mean age 55 (range 19–98 years)] underwent TAE to treat pelvic fracture associated haemorrhage. The mechanism of injury was road traffic accident in 18 patients; the other 6 were fall from height. Upon arrival to the emergency department, first-line trauma CT is performed as per local protocol, n = 23 received a local trauma CT and one case underwent a trauma CT elsewhere before transfer to our MTC (images were accessible locally) The decision to refer for TAE is not only based on CT finding of an active arterial pelvic bleed. It is also judged by other parameters such as ongoing clinical deterioration, severity of trauma and haemodynamic instability, all suggestive of continuous bleeding. Almost 58% of patients were haemodynamically unstable with manifestations of acute haemorrhagic shock. Isolated pelvic fracture was present in 5 patients; while the majority of patients had multiple associated injuries [head (n = 8), spinal (n = 9), chest (n = 15), and abdominal injuries (n = 5)]. The average ISS was 47 (range 25–60). Primary outcome measure was bleeding cessation at the end of procedure (100%) and secondary outcomes included post procedure early, late complications (0%) and mortality (29%). Tables 1, 2, 3 summarize the patients’ clinical characteristics, computed tomography (CT) and angiographic findings and type of embolisation performed. Different measures have been described to define embolisation success. Some studies have reported procedural success as lack of subsequent intervention, reduction in blood transfusion requirement and/or reduction in mortality. In other studies, TAE success was confirmed with the cessation of bleeding at the end of procedure (Katsura et al., 2013; Hauschild et al., 2012; Barentsz et al., 2011; Metsemakers et al., 2013). TAE has been shown to be 85–97% effective in controlling haemorrhage secondary to pelvic trauma (Cullinane et al., 2011). In our retrospective review, we used the lack of contrast extravasation at the end of the procedure, and bleeding cessation was achieved in all of the cases, giving an overall success rate of 100%. Treatment success in the form of non-requirement for subsequent intervention has reported rates of up to 95% (Velmahos et al., 2002; Ierardi et al., 2015). This is due to previous studies suggesting secondary bleeding following initial embolisation may be due to cessation of vessel spasm. Vessel spasm is thought to be secondary to local inflammatory response generated by bleeding or hypotension (Dietrich & Dacey, 2000). 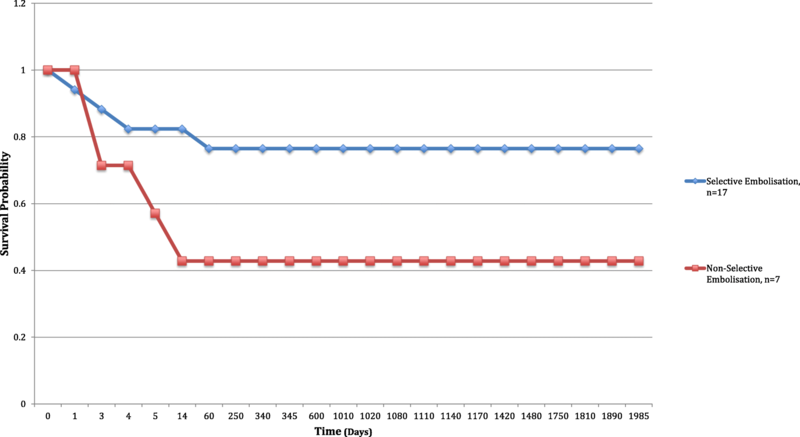 Hence these results may not directly reflect the efficacy of TAE itself. Additionally, the success of embolisation may be influenced by the coagulopathy present in 25–40% of polytrauma patients, which is directly related to the injury severity score, and is believed to be secondary to aggressive resuscitation with crystalloids and depletion of clotting factors (Brohi et al., 2003; Cosgriff et al., 1997). Using mortality or blood transfusion requirement as a marker of treatment success is controversial, as most patients have associated extra pelvic injuries, which can be the leading cause of death. The mortality rate of 29% at 30 days in this study was comparable to others which range from 17 to 47%, while the most common causes were adult respiratory distress syndrome and multi organ failure (Agolini et al., 1997; Ierardi et al., 2015; Niola et al., 2012). It has been established that the time taken from admission to TAE influences success rates, with increasing delays worsening the morbidity and mortality outcomes (NICE, 2016). A previous study reported improved survival rate when TAE was performed within 1 h from admission (Agolini et al., 1997; Tanizaki et al., 2014). However, the availability of IR services varies between hospitals and may be further limited by out of hours access. Where services are available 24 h a day in MTCs, the recently National Institute of Clinical Excellence (NICE) guidance have identified areas of improvement with time to access that should be in line with that of surgery (NICE, 2016). Increasingly, the need for hybrid theatres has been advocated to reduce the delays and improve patient outcome (Tran et al., 2016). 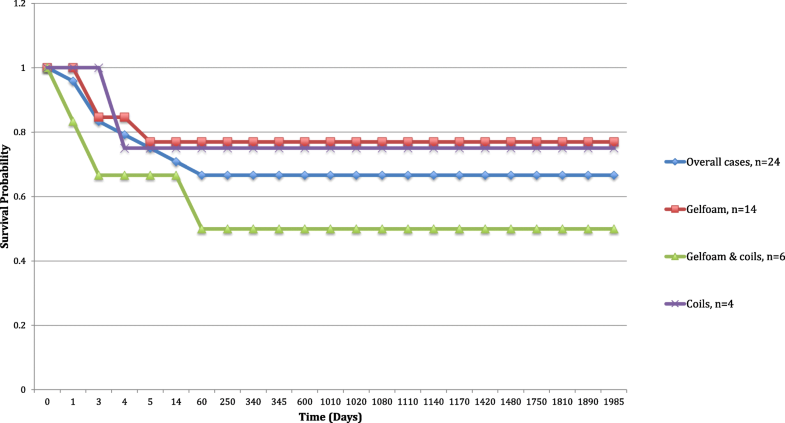 We reported a median time from admission to embolisation of 199 mins (range 82–1285 min), which was comparable to previous studies (Schwartz et al., 2014). The time to embolisation was partly over-estimated and confounded by a couple of cases that were taken straight from door to theatre, prior to embolisation. Although endovascular embolisation is considered to be a safe technique, there are reports in the literature of complications (Velmahos et al., 2000a; Velmahos et al., 2000b). Puncture site complications due to poor closure may result in pseudo-aneurysm formation or groin hematoma (Frevert et al., 2008). Few studies have also reported post procedure complications such as gluteal, bladder, femoral head, and skin necrosis (Suzuki et al., 2005; Obaro & Sniderman, 1995; Sieber, 1994). Other complications include paresis, impotence and surgical wound compromise have been described after embolisation in the pelvic region (Travis et al., 2008; Lee et al., 2000). Unintended or non-target vessel embolisation could account for these findings. Alternatively, the complications may be secondary to the type of embolisation performed; selective or non-selective. One report suggested higher complications rate with non-selective embolisation, however the difference did not reach statistical significance (Travis et al., 2008). Other studies suggested that bilateral non-selective embolisation of the internal iliac arteries is not associated with increased risk of complications (Fu et al., 2013; Auerbach et al., 2012). Due to the rich collateral arterial supply within the pelvis, proximal embolisation can be safely performed without causing major complications. In our study, a majority (71%) of cases underwent selective embolisation, with no complications reported in the entire study population and there was a greater survival probability amongst these patients. In general, embolisation will create ischemia and necrosis that should be limited to the least possible area. Therefore, selective embolisation of the bleeding point demonstrated at the time of angiography should be considered. TAE is a safe and effective technique in controlling haemorrhage associated with pelvic fracture. Hence, it should be considered once arterial bleeding is suspected based on clinical, biochemical and radiological findings. Amir Awwad and Permesh Dhillon contributed equally to this work. For data and supporting materials access, please contact authors for data requests. All listed authors have read and approved the final manuscript. All listed authors contributed sufficiently to take responsibility for the whole content of the manuscript following the criteria in ICJME guidelines of authorship rights and responsibilities. (‡) denotes a joint contribution of the first two authors (AA & PD) in drafting, design, revising, analysis and preparation of data. GR, SH, WAO contributed to conception, coordination, revisions and final approval of submitted version. All procedures reported in the study involving human participants were in accordance with the clinical ethical standards of the institutional and national research committee and with the 1964 Helsinki declaration and its later amendments or comparable ethical standards. Informed clinical written consents were obtained prior to procedures, either from competent patients (form type I) or in incapacitated cases (form type IV) after documented discussion between involved clinicians and relatives/carers. All figures and/or cines used in preparing the manuscript are anonymised and contain no individual or identifiable personal data.